Palm Beach Restaurant Partner's newest concept. 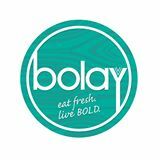 Bolay takes a fast-casual approach to fresh, bold and flavorful food that invigorates the palate. Created by Outback Steakhouse co-founder Tim Gannon with his son Chris Gannon, the restaurant invites diners to build bowls for lunch and dinner, packed with nutrient-rich superfoods and tasty proteins. With ingredients that uniquely customize bold, innovative flavors, including gluten free selections, Bolay innovates the build your own bowl experience, and pairs it with refreshing cold-pressed juices, infused teas & local craft beer and wine.